I agree receiving commercial electronic messages to my contact information above for marketing activities such as newsletters, advertisements, campaigns, promotions and using my information for this purpose by Magmaweld covered by General Data Protection Regulation (GDPR) by Magmaweld. In the processing of personal data, we would like to inform you as Magmaweld about the General Data Protection Regulation (GDPR) which was published in order to protect the fundamental rights and freedoms of the individuals, especially the privacy of private life and to determine the obligations of the real and legal persons who process the personal data. The General Data Protection Regulation (GDPR), which came into force on May 25, 2018, covers the security of all kinds of personal data of our employees, suppliers, customers, visitors, business partners and related persons in the oral / written and / or electronic environment processed in this scope. With this regulation, the rules related with personal data processing activities and personal data protection procedures are determined. The processing of personal data in accordance with the regulation is carried out with your permission. You also have the right to cancel your personal data processing at any time. You have the Access Right to request access to your personal information and how we operate it. You have the Right to Revise to correct If your personal information is incorrect and complete incomplete personal information. You have Data Transfer Right to electronically move, copy, or transfer your personal information in a standard manner to restrict the processing of your personal information. You have the Right of Objection to object the processing of your personal information. You can send your request about using these rights by sending the GDPR Consent Application Form to kvkk@zaimogluholding.com.tr . If you have any general questions about your rights, please contact kvkk@zaimogluholding.com.tr . Similarly, www.magmaweld.com.tr obtains the right to change any detail of the content of the website any time without notice. All kinds of audio, visual, written material and the content on the Website is reserved and belongs to www.magmaweld.com.tr, unless stated otherwise. Please, note that unauthorized use will be illegal and legal proceedings can be initiated by www.magmaweld.com.tr against related users. The content of the website which is allowed to be downloaded is strictly for personal use only. Permission to download the contents may not be interpreted as an approval for the commercial use of data. Any content downloaded from the Website must be used completely or partially without any addition or modification. Any content of the Website may not be used without reference to the Website. www.magmaweld.com.tr reserves the right to make changes in terms of quality or quantity of the products in the Website. Product on the images on the website may differ from the actual products. These differences may occur in packaging, size and other properties depending on region or country. www.magmaweld.com.tr can request some personal information during or after the establishment of membership. This information is used to provide efficient and quality service to our users and / or Members, to do marketing activities in terms of products and services, contacting, information update and modification, realization of payments and similar purposes. www.magmaweld.com.tr may send informative e-mails on regular or irregular basis, unless otherwise is requested. These e-mails may include the promotion of www.magmaweld.com.tr or third parties. At any time, you can unsubscribe from receiving notifications by using the links in e-mails. If you wish to unsubscribe from www.magmaweld.com.tr, you may send an e-mail to info@magmaweld.com.tr or you can click on the “Announcement Subscriptions” link on the “My Account” page. All your credit card and personal information is protected by SSL system and is encrypted with 128 bit, which will be implemented by our service provider and contracted banks. In this respect, we inform you that www.magmaweld.com.tr has the utmost care to ensure the security of your information; your personal information about the payment will not be held by www.magmaweld.com.tr and will not be shared with third parties; We would like to inform you that the security of the elements such as hardware and software used to access www.magmaweld.com.tr is beyond the scope of the responsibility of www.magmaweld.com.tr. Cookie: A cookie is a file that contains a series of characters / information that is sent to your computer when you visit a website. Cookies allow personalized web pages to be presented. There are two types of cookies; Permanent Cookies and Temporary Cookies according to their validity period. Permanent Cookies: They are created when you visit the website and remain until you delete or they expire. Temporary Cookies: They are created when you visit the website and are valid only until you close your browser. To improve the services offered to you by improving the functionality and performance of our websites. Cookies are used for security measures and various analyzes. Any personal data is not collected through cookies. Cookies can be checked or deleted by the user as they wish. These processes can be used and done through Internet browser software. Many browsers accept cookies by default / automatically. However, users can change it with browser settings and prevent the registration of cookies. Session cookies are used during the visits of our visitors to the Website. These types of cookies ensure that our website works properly during your visit. The objective of OERLIKON A.Ş. in managing information security is, the protection of it against possible internal or external intentional or accidental threats by means of evaluating the same within the scope of confidentiality, integrity and accessibility and the performance of the activities carried out in an efficient, accurate, fast and safe manner. Another objective of the information security policy is to communicate all related parties of the OERLIKON A.Ş. information security requirements and to establish the basic grounds of all written rules. OERLIKON A.Ş. Information Security Management System covers the entire organization. The implementation of this policy is important to demonstrate and maintain the compliance of the relations with the services provided. - Information is secured against unauthorized access. - Its confidentiality, integrity and access by authorized users are provided. - Furthermore, the relevant legislative and executive requirements are fulfilled. 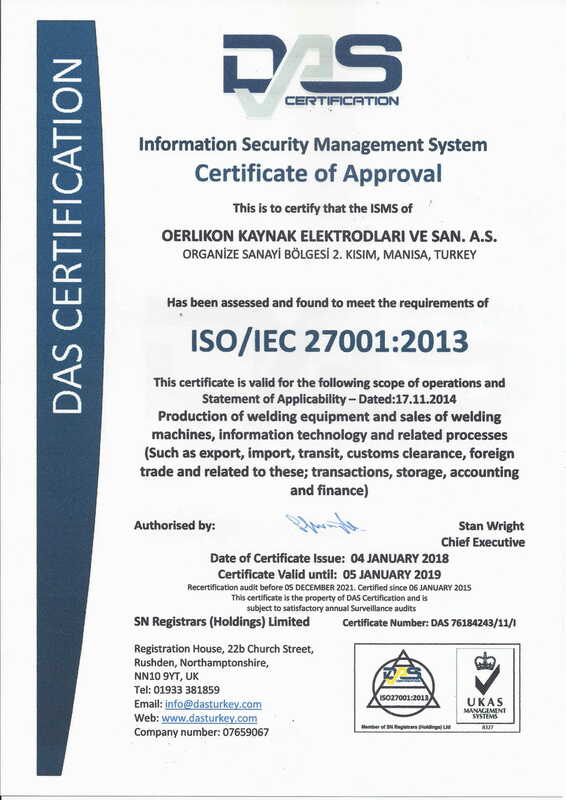 In OERLIKON A.Ş., identity information, customer information, special software, software packages and servers are the assets under protection.